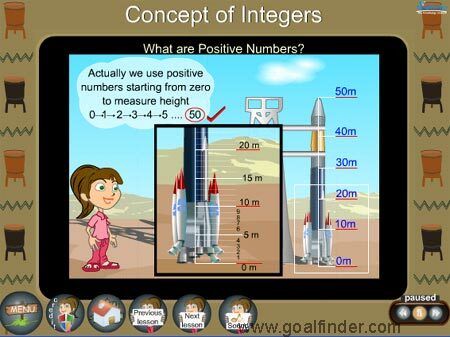 Fully animated ‘Introduction to integers’ covers the concept using real life examples. This will help you unserstand and apply the concept of positive and negative numbers. What is union of sets? What are these new negative numbers? What are the uses of negative numbers? What do we get from the number line? Why do bigger negative numbers are said to be smaller? How to compare numbers on a number line? Introduction to integers is explained through real life examples and situations, the concept of positive and negative numbers is brought out clearly through these examples. This is like an animated math tutorial but with entertainment and stories to make learning integers a fun. We have provided many examples to clarify doubts in integers. Janet explains the concept of negative numbers through the example of a well. Introduction to Integers with real life examples is the basis of the animation. The concept of set and union of set is explained using examples. Introduction to integers and positive and negative numbers are supported with more examples. Positive integers means things associated with increasing, ascending, gain etc while decreasing, descending, loss etc denote negative integers. Another example introduces representing integers on a number line, rules are needed for understanding how to write integers on a number line, for example : An integer is always larger than one on its left. Then the concept of additive inverse is brought out through number line and real life examples. Example +31 and -31. Comparing integers through number line and absolute value are also covered. 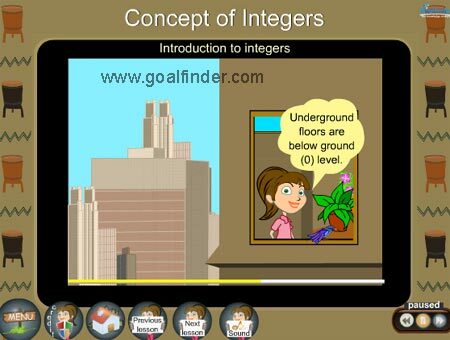 The animation covers the introduction to integers using real life examples; a quiz section with detailed solution also checks your understanding.